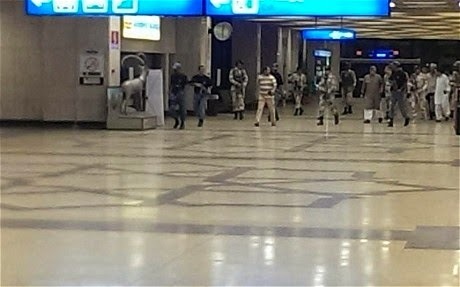 08/06/14 Karachi, Pakistan: Heavily armed gunmen have attacked Karachi's international airport, killing at least five security guards and hurling grenades, reports say. Pakistani media reported between four and 10 gunmen had attacked Jinnah International Airport's old terminal. Dawn News said security personnel had surrounded the airport and sealed off roads, and the army had been called in. All operations at the terminal have been suspended and flights are being diverted, it said. Staff are being evacuated. Billowing smoke The security guards killed were said to be part of the Airport Security Force (ASF). A doctor at Jinnah Hospital told Associated Press five bodies had been brought there, as well as one wounded person. Dawn said the gunmen had infiltrated from the Fokker Gate area. Some reports said they had cut through a barbed wire fence. There is no indication yet who is carrying out the attack. An ASF spokesman told Agence France-Presse that the gunmen had reached the runway and that a "gun battle is continuing between terrorists and [armed] forces". Dawn reported that some attackers had managed to get inside one plane and that three planes had been damaged. Geo News said two attackers were also reported dead and that smoke is billowing from the terminal. The terminal is not normally used for commercial flights but for cargo and special VIP operations. Pakistan has been fighting an Islamist insurgency for more than a decade, with the Pakistani Taliban the main militant group. Karachi has been a frequent target for insurgent attacks. Gunmen attacked a naval base there in 2011, killing 10 personnel and destroying two aircraft in a 17-hour siege.